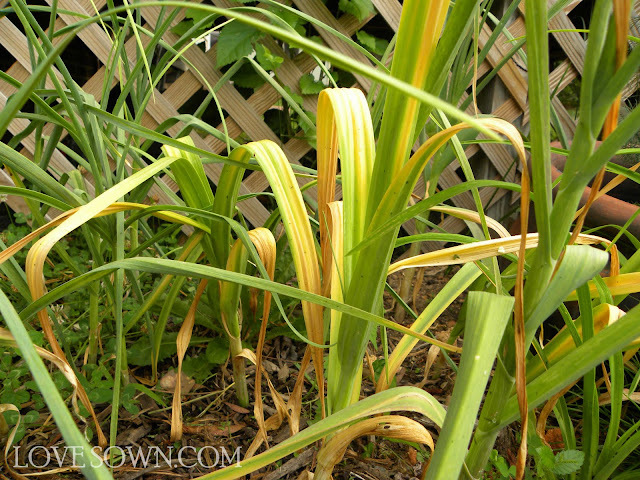 Last fall, I planted a three foot by three foot space of garlic in the back corner of my herb garden for the second year in a row. 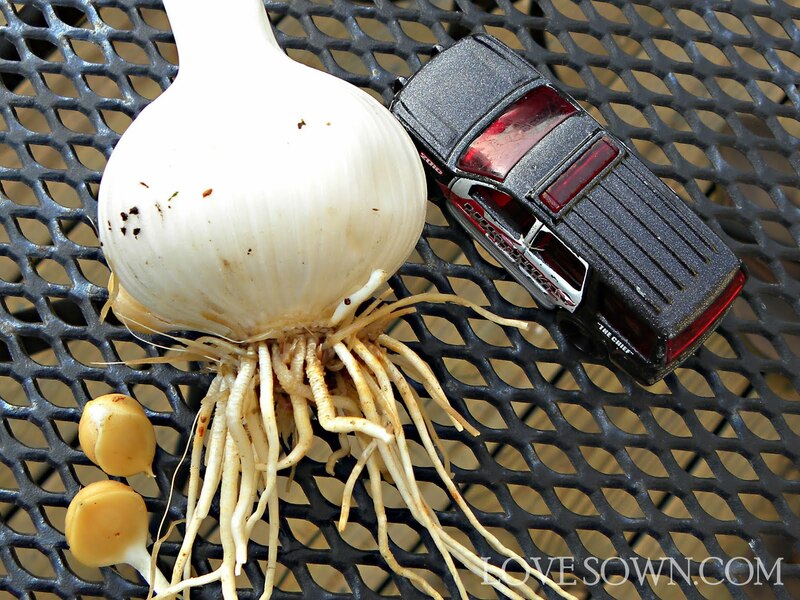 I planted three or four varieties, including elephant garlic that I received in a Papa Spuds delivery and some Spanish Garlic, which I saved from last year's harvest. Last year, while the bulbs did develop and packed a flavor punch, due to the lack of nutrients, they were so tiny they almost weren't worth the effort of peeling. 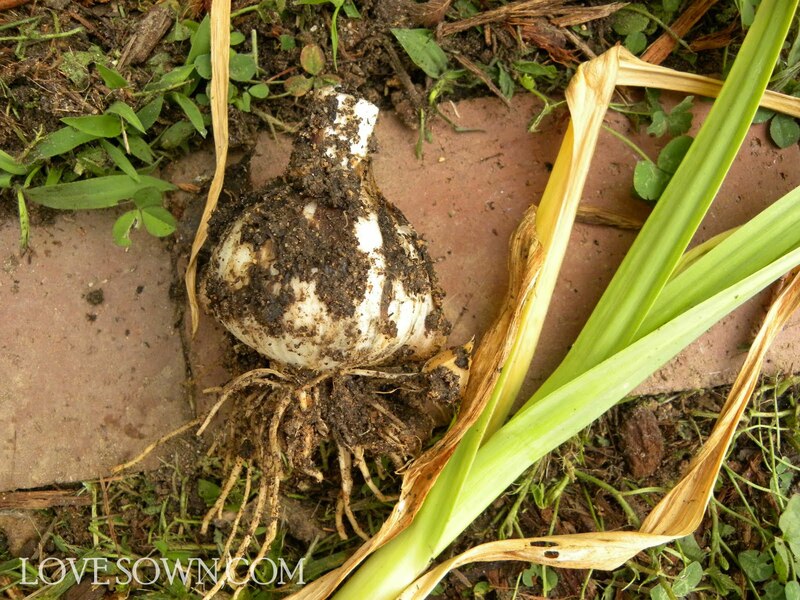 Early in the Spring I began applying Alaska Morbloom 0-10-10 to my bulbs to encourage root growth. It isn't the cheapest product but it contains fish emulsion, a natural fertilizer. Just one to two tables spoons mixed in with a gallon of water covers 25 sqft, so my quart is going a long way. Once the weather warmed up, I quit using the Morbloom and switched to Miracle-gro Organic Choice Bloodmeal to encourage leaf growth. I start pulling up garlic when the leaves have slowed their growth and 1/3 of them are brown. Not all my garlic turns at the same time, which allows me to space out the harvest. While some people like to braid their garlic and hang it to dry, I like to wash mine off and let them dry on a paper towel in the kitchen. The soil isn't lose enough to pull up the garlic by the green, and I had to dig this one out with a shovel when the stalk snapped off. This is the elephant garlic. I threw in a Hotwheels car for size comparisson. It isn't as big as the ones in the supermarket, but for homegrown garlic, it looks pretty good.